Should Sustainable Investors Expect Worse Returns? ESG investing shows a track record of outperformance. Removing sin stocks had a negative effect on performance. Sin stock outperformance should persist while ESG outperformance should wane. Traditional finance theory is built on the premise that investors are purely risk averse and profit-seeking entities. But given the rise in socially responsible investing (SRI) and environmental, social and governance (ESG) investing, it’s clear that certain investors want more than just solid returns. Does this mean that SRI and ESG investors are doomed to underperform? The efficient market hypothesis postulates that all publicly available information is “fully baked” into stock prices. If firms with superior ESG standards do achieve higher earnings, this characteristic should already be priced into a stock and should not translate into higher long-term returns. If investors restrict their universe of securities, they should incur diversification costs. These costs would be due to the increased uncompensated risk of the strategy. Yet, there is a plethora of academic and industry research that suggests that ESG investing earned positive “alpha”, or riskless return, during prior decades. This research can be thinly sliced to examine each of the ESG factors. The consensus findings indicate that strong environmental and social performance led to a low to moderate risk-adjusted return improvement while strong governance standards provided a larger return improvement, though this outperformance has evaporated more recently. Worst case scenario, the research suggested that one should perform no worse than a diversified index fund. Many investors shun sin stocks without regards to economic fundamentals putting downward pressure on the prices of these assets. Well known academics Merton, Fama and French have all published research that suggests that a “value premium” explains a portion of asset returns, implying that overweighting value stocks should produce higher long-term returns. Governance and accounting policies of sin companies tend to be very strong, likely because of additional public scrutiny. This leads to a higher level of governance factor exposure, which in the prior section, was demonstrated to improve risk-adjusted returns. Like ESG investing, restricting the universe of securities should incur a diversification cost. 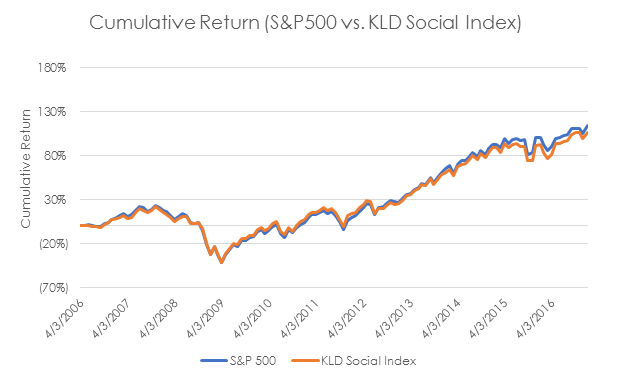 The KLD Social Index incorporates ESG factors into its screening process while also excluding tobacco companies. Over the last 10 years, this index has tracked very closely to the S&P 500, underperforming the S&P 500 only slightly in latter years. This begs the question: Has the market already adequately priced in ESG factors? Research and conventional wisdom do seem to suggest that if performance is your primary concern, it may be too late to get on the ESG bandwagon. As firms with high ESG standards become correctly priced by the market, opportunities for significant alpha should diminish over the long-run. And several researchers have already concluded that alpha from strong corporate governance and social exposure seems to be diminishing or is non-existent at present. Unlike ESG investing, sin stocks appear to have maintained their outperformance over time. Given that many large-scale investors have not changed their stance on sin stocks, it makes sense that outperformance continues to persist. However, even if investors know with 100% certainty that ESG investing and SRI will lead to lower returns, they often find comfort in the fact that they’re earning close to a market return while sticking to their principles.